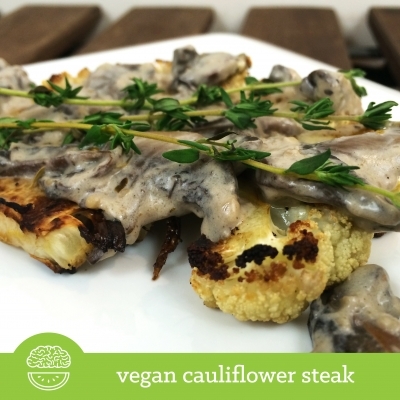 Ripped Recipes - Vegan Cauliflower "Steak"
Home » Recipes » Dinner » Vegan Cauliflower "Steak"
Vegan... steak? Why not?! The mushrooms in this gravy sauce make this vegetable slab meaty enough to fool the senses! Totally whirl-worthy! Cut cauliflower head into 4 1/2â€“3/4" thick slabs. Brush about 1/2 tsp of olive oil on each cauliflower slab (split between both sides) and sprinkle steaks with salt & pep to season. In a large skillet sprayed with cooking spray, sear steaks for 2â€“3 minutes on each side. Transfer to a baking sheet lined with foil and sprayed. Bake 12-15 minutes, until lightly browned, flipping halfway through. While the steaks bake, make your gravy. First, cook garlic and mushrooms in a skillet (I just used a little cooking spray) and set aside. Heating butter in a pot over medium heat. Add almond milk, and once bubbly add oat flour. Whisk and allow to thicken. Add dairy free sour cream (or yogurt), salt, pep and thyme. Cook for about 2 minutes. Remove from heat. Stir in mushroom/garlic mixture, coating thoroughly. Spoon gravy evenly over each cauliflower steak. Optional: Garnish with fresh thyme sprigs.